Michelle Meadows, director of career and technical education at the Cary Area Career Center, has built a team of experienced, qualified teachers. 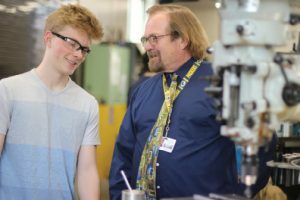 It’s been talked about for years in the news and written about in business and trade magazines – there’s a shortage of skilled workers in the U.S.
An ongoing effort to provide high school courses and hands-on training in career and technical education (CTE) is helping to bridge that gap and creating a renewed interest in fields that are in dire need of skilled labor. “Sometimes it is difficult to find qualified teachers in career and technical educational areas due to the highly technical knowledge and hands-on skill set these positions require. 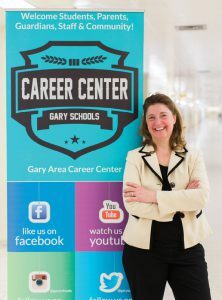 But these are exactly the type of people we need in order to give students the type of education that is sought after by employers,” says Michelle Meadows, director of career and technical education at the Gary Area Career Center. “These teachers require a college education and a journeyperson knowledge level of a career area. They also must have a certain compassion and ability to relate with young adults,” says John Groth, director/principal of Porter County Career and Technical. John Groth, director/principal of Porter County Career and Technical Education notes that the reduced salaries can be a barrier in hiring. Although it can take some searching, both administrators have found suitable individuals who have left their fields for the classroom to train the next generation of welders, auto mechanics, barbers, and health care professionals. Hannah Celorio is new to teaching, but not new to working in a school. 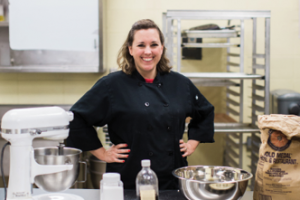 She joined the staff at Gary Area Career Center in December, after working as a paraprofessional, as a way of combining two of her passions, cooking and teaching. In 2012, she enrolled at Le Cordon Bleu in Chicago and did externships with such places at the Lighthouse and Strongbow Inn followed by banquet chef positions. “I’ve always had a drive for teaching,” she says. Her lessons go beyond knife skills, kitchen safety and cooking techniques. They include life skills and she relishes that “motherly” role. “I teach them how to do resumes and be a professional and have confidence and take constructive criticism without being offended,” she adds. The program is in the process of being restructured and will allow for dual credit through Ivy Tech in addition to industry certifications. Celorio believes that such practical paths of study are needed for this generation. “I’m teaching all the way around, not just to prepare, but how you shop and make good choices and support local growers and take a stand on where your food comes from,” she says. “The greatest part is when students return to share their life experiences and success stories and thank me for caring,” says Dionne Bass-Grady, cosmetology instructor at the Gary Area Career Center. 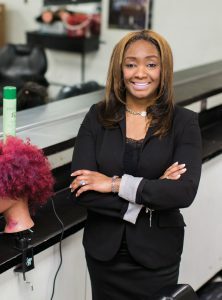 Dionne Bass-Grady decided to take her talents from the stylist’s chair to the classroom, at the Gary Area Career Center to prepare young people for jobs beyond high school. “I decided to teach because I wanted to give back to my community, to be a leader and a role model. I wanted to provide the necessary tools needed to become successful no matter where they’re reared or what challenges may arise, while stressing the importance of jump starting a career while still in high school as I did,” the cosmetology teacher explains. “As a teacher, it’s going beyond textbooks. I teach how to deal with their emotions and how to solve problems. I teach them to become independent, the importance of prioritizing and life skills,” she says. Former construction field project manager, Barbara Biernat, left her career to lead the building trades program at the Porter County Career and Technical Center. 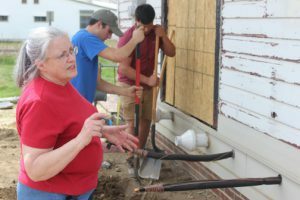 She and her students are renovating a 1912 train depot at the school’s campus. Once completed, it will be used as a new school of cosmetology for the career center. At a time in life when others may be contemplating retirement, Barbara Biernat went the opposite direction, diving into a new career where she could pass on her vast knowledge of construction with an audience hungry to learn. Now in her third year leading the building trades program at the Porter County Career and Technical Center, Biernat brought with her decades of experience in home and commercial building, remodeling, and interior design. She worked as a field project manager on the construction of hotels, senior housing, and retail spaces and managed her own company. Beirnat and Groth had previously worked together on volunteer construction projects in the community. When a 1912 train depot was acquired and brought to the Porter County Career and Technical Center property to be renovated in 2014, Groth reached out to her. The train depot, with the work of Biernat and her students, will be completed this year from an aging 106-year-old relic to a functional space that will serve as the new school of cosmetology at the campus. Biernat said that the idea of teaching had crossed her mind, but she thought more schooling for an additional degree would be required. In reality, she was able to take a year-long online course that made her eligible to teach construction or building trades. Welding has long been an area taught at vocational high schools and it’s a field that is starving for qualified candidates to replace those leaving the work force. “I have always been the person to reach back and help another, so teaching fell in place for me,” says Harry Miller, welding instructor at the Gary Area Career Center. Harry Miller’s career stems back to 1969 and he’s been in the classroom since 1977. He started the welding program for Ivy Tech Northwest, restarted the South Bend School system’s welding program, and wrote welding curriculum statewide. 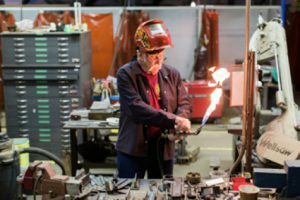 He retired from Ivy Tech in 2006 after 29 years, where he racked up nine state welding championships. With a long tenure in his field and in education, Miller chose to continue to teach, this time at the high school level and restart Gary’s welding program. “I have always been the person to reach back and help another, so teaching fell in place for me,” Miller says. “I do have a passion for construction and being a builder and fabricating with welding skills.” He says expertise in welding opens up a lot of doors in the working world. Bob Phelps previously spent time in the field as a TV news camera-man for WNDU, the NBC affiliate in South Bend, but now lends his expertise to teaching television photojournalism at the Porter County Career and Technical Center. Like many of the other CTE offerings, most of Bob Phelps’ students at the Porter County Career and Technical Center are with him for two full years as they learn the ropes of television photojournalism. Phelps previously spent time in the field as a TV news cameraman for WNDU, the NBC affiliate in South Bend. The tough and demanding industry comes with unpredictable schedules and long, intense workdays. So, when the opportunity arose for a steady weekday gig as a teacher, it was hard for Phelps to pass up. He misses the excitement of the job, but freelance work helps to fill that void. “Maintaining a connection to the industry is vital to providing a quality education to my students,” he says. As principal of the Area Career Center in Hammond, Miller oversees a facility that provides career and technical education to students from 12 area high schools in 16 different areas of study, including welding, early childhood education, criminal justice, cosmetology, and graphic arts. 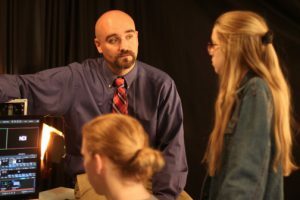 After about five years working in the field of information technology, Miller decided to make the shift into teaching, due in part to the influence of his parents who were both educators. He’s an advocate of technical training and even has a daughter who is a student at the school. Each of these individuals took a leap into education as a second career with the payoff of inspiring and training the next generation of skilled workers in the region. It was a move that made sense for each of them. Biernat says she could not be happier with her second career. “I would encourage anyone who has worked in industry to consider teaching. it brings so much value to these kids,” she says. Due to these skilled teachers’ decisions, each year students will move on into the workforce or into the next phase of their education with a foundation and hands-on knowledge that could only be provided by those who had worked in the field. “The greatest part is when students return to share their life experiences and success stories and thank me for caring and being a valuable source for their future,” says Bass-Grady. Click to read more from the Jun-Jul 2018 issue of Northwest Indiana Business Magazine. Carrie Steinweg is a freelance writer, author, blogger and photographer living in Chicago’s south suburbs with her husband and five sons. Her work has appeared in more than two dozen print and online publications. An author of six books, Carrie has penned three are historical titles, two children’s books (“Into the Night” and “Old 104 Ridges Again”) and “Mom Moments,” a compilation of her parenting columns from the Northwest Indiana Times. Carrie is a foodie who thoroughly enjoys traveling and visiting new restaurants and craft breweries, attending food festivals and trying out new recipes and kitchen gadgets. She writes about her food experiences at ChicagoFoodieSisters.com, a popular blog launched in 2011.